I've written a lot about Safeco Field lately and my opinion that the fences need to be moved in. Mostly in part to the article that I read from way back in 2001 that noted factual reasons that one may find it harder to hit at Safeco Field. You can find that article here. Since that time, I have looked at a lot of other reasons that our team may be struggling and have found one that is particularly intriguing. The Los Angeles Dodgers. If you've been paying attention to the MLB outside of the Mariners, you were probably as surprised as I was that the Dodgers were leading the A.L. West at all this season. Don Mattingly had taken this team to a new level and had them at the top of their division with leaders such as Matt Kemp and Andre Ethier. Matt Kemp had missed a lot of May with a strained left hamstring and returned at the end of May to only re-injure himself. He is still out and looks to return by the All-Star break. Now, Andre Ethier has been out as well with a strained left oblique muscle since the 27th of June and will most likely return within a week as he was not put on the disabled list. So, what does all this have to do with the Seattle Mariners? Well, since Matt Kemp has been out, the Dodgers have been on a steady decline. With Ethier out as well, the Dodgers simply stopped winning games. It got bad in a hurry. The question is, why couldn't the Dodgers win games without Kemp or Ethier? The answer is not a simple one. Some would like to chalk it up to the fact that the rest of the team is just not good, but that isn't the case. Matt Kemp and Andre Ethier are proven commodities. They show up at the ballpark, they hit in their prospective positions in the order and they do their job. They hit, they score, they flat out produce. That's their jobs. Everyone else has the role to get on base and make themselves available to score. It's their jobs to do the little things that help a team win. Now, because of the injuries, the Dodgers have Jerry Hairston batting 3rd and Juan Rivera batting 4th. Normally it would be Kemp 3rd and Ethier 4th but without either of them in the lineup, Don Mattingly has had to rely on these other guys to come through and do more than just help, but now carry a team. Back to the Mariners. The Mariners are full of young talent and in my best guess, good young talent. We haven't seen the best of Justin Smoak or Dustin Ackley, we're not even to the surface of Jesus Montero of Michael Saunders and there is a heck of a lot more we can expect from Kyle Seager and Casper Wells. Our issue is that we are expecting these guys to carry the team on their shoulders and none of them should be doing that at this point in their careers. Take a look at Mike Trout and Mark Trumbo for the Angels. They are hitting amazingly well and both are on the All-Star team. They are also surrounded by guys that have the ability to be game changers, guys that are experienced in carrying a team on their backs. The Mariners, they have nobody for that role. To draw a parallel, some people are leaders, others are great at helping leaders succeed and some are just good at what they do and can really be an asset to any team. The veterans on the Mariners are guys that are really great at helping a leader succeed. Brendan Ryan, Chone Figgins, Ichiro Suzuki, all great at what they do, but are not leaders. The guys that are leaders are guys like Jesus Montero and Justin Smoak but they didn't even have a chance to get their feet wet before being asked to lead this team. It's almost like asking a kid to lead a company. He's going to be horrible and make a ton of mistakes and he'll eventually grow into it if he doesn't quit first. Smoak and Montero are trying to grow into their roles and that may take longer than anyone is willing to wait. All the other guys are in the same boat. Casper Wells has a great couple of games, let's put him in the middle of the order! Kyle Seager has been our best hitter. Let's hit him third now! Heck, John Jaso was batting 3rd today with Seager at the 4 spot. We continue to apply the pressure on these guys that should never be applied at this stage in their careers. Bryce Harper is another name being talked about for the All-Star game. Rookie season, lots of expectation on this young kid, but he doesn't have to carry his team. He simply has to help. They have guys on the Nationals like Ryan Zimmerman that can carry the load. The only problem for the M's is that they don't have anyone that can carry anything. If one of these kids could grab a hold of that and start hitting in comparison to a Mike Trout or a Mark Trumbo, everyone else would start to get a little better every day. The only other option is to go out and get a free agent that can really be that team leader. Someone that knows how to handle the pressure, someone who knows how to carry a team. 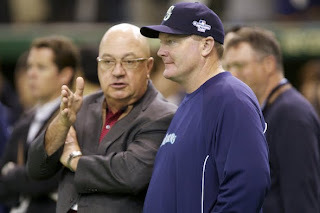 There may not be a player in reach for the Mariners in their current state, and if there is, we may not be willing to pay for it. So, at the end of the day we just continue to be patient. Waiting for someone to finally grab a hold of that leadership role. If not, we start seeing these young guys traded away and try our luck with other young players and wind up with the same issues. I'm really hoping that we get an answer before seeing Justin Smoak hit 40 homeruns with another team. It's possible, but I believe it when Eric Wedge says that we need to be patient and am coming to an understanding that it will take time for these guys to develop. I always thought that he was talking about developing their swing, their approach, etc. Now I am convinced that he is waiting for a couple of these young guys to emerge as leaders. For that to happen, they have to believe that they are leaders today even if they don't see the results until tomorrow.